As folowers of Jesus Christ, we will, by our intentional actions, seek a deeper relationship with God, listen for the Spirit's call to mission in our community, and prayerfully lead others to know the joy of God's love, and to realize God's purpose for life's journey. As Africa Community Health Facilitator, Luta Garbat-Welch will advise partners on community health and development programs in the Democratic Republic of the Congo, Ethiopia, Malawi, South Sudan, and Zambia. She will promote the development of Community Health Evangelism programs, an initiative that brings people together around priorities of evangelism, community health, and discipleship. from one another. Her duties include a special focus on the health ministries of Malawi’s Synod of Livingstonia, helping the synod with organizational development and the implementation of its strategic plan. Jeremy felt a tug toward long-term mission service while working in Cameroon. He was involved in an 18-month mission assignment distributing donated computers and helping Cameroonian schools start or upgrade computer labs. “I heard God calling me to serve as a hospital chaplain and to help train chaplains in countries where seminaries do not generally offer such courses,” Jeremy says. “Seminary, chaplain training, and hospital experience have helped confirm my call to not only serve patients in hospitals, but to help train ministers,” he says. As the son of missionaries in Africa, Jeremy, like Luta, experienced the continent as a child.“While we have always been open to wherever God would lead us in mission, we have always felt our gifts have been shaped by and for the work in Africa.” Jeremy observes. Luta will bring her gifts for facilitating positive change in communities and her public health expertise. Initially, Jeremy will focus on assisting Luta in this role and caring for their young son, Jathniel. Eventually, he anticipates helping African partner churches train ministers in pastoral care. Both Luta and Jeremy say they are excited to return to the continent that shaped their childhoods. “We look forward to the sights, smells, sounds, and tastes that remind us of home,” Luta says. Luta’s parents are Doug and Ruth Welch, who served in the Democratic Republic of the Congo and Malawi. 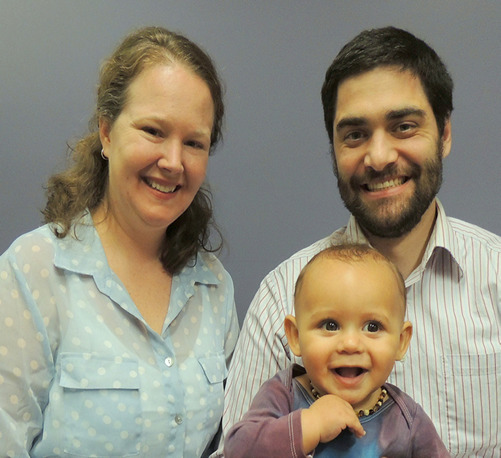 Jeremy’s parents, James and Marla Garbat, worked in Cameroon under appointment by the North American Baptist Conference. Prior to entering mission service, Luta served with Catholic Charities of Louisville as its statewide refugee health coordinator. She also has worked for Kentucky’s Department of Public Health as its lead immunization epidemiologist and as an immunization assessment coordinator and HIV health policy specialist. She earned a bachelor’s degree in biology from Whitworth College, a Presbyterian school in Spokane, Washington, and a Master of Public Health degree from Tulane School of Public Health and Tropical Medicine in New Orleans. Jeremy worked as a staff chaplain at the University of Kentucky’s Albert B. Chandler Hospital. He has completed clinical pastoral education residencies at Norton Healthcare System and Baptist Healthcare System, both based in Louisville. He earned an undergraduate degree from Whitworth College with a double major in mathematics and computer science. He holds a Master of Divinity degree and a Master of Arts degree in pastoral counseling from Asbury Theological Seminary in Wilmore, Kentucky. An ordained Disciples of Christ minister, Jeremy is a member of Hurstbourne Christian Church in Louisville. Luta has been involved in two Louisville congregations, Hurstbourne Christian and Beechmont Presbyterian. Jeremy is a trained chaplain and will be exploring opportunities to use his skills with the Church of Central Africa Presbyterian which has expressed great interest in chaplaincy training. (present-day Equatorial Guinea in West Africa) in 1869. Traditionally the PC(USA) has been particularly concerned for the poorest and most marginalized people groups in Africa. While the continent has abundant natural resources, unjust economic and political systems have kept the people from enjoying their benefits. Africa is home to severe poverty and millions lose their lives each year to the diseases that accompany poverty such as malaria, HIV/AIDS andtuberculosis. The PC(USA) is working to address these problems with African partners through education, health care, and community development ministries. At the same time, our partner churches in Africa are growing rapidly and are experiencing severe clergy shortages. The PC(USA) is working with our partners to train more leaders through seminaries and special training events. Our congregation contributes to Basic Mission Support through our budgeted mission giving and receives four church wide special offerings each year. Basic Mission Support is the funding sent by congregations to support the mission budget of their presbytery, synod, and General Assembly. Basic Mission Support strengthens congregations, supports mission service personnel, and provides leadership training and scholarships. Because of your gifts to the Peacemaking Offering, young adults were able to go to Colombia in January 2006 on a young adult travel study seminar, co-hosted by the Presbyterian Peacemaking Program and the Vice-Moderator of the Office of the General Assembly. These young adults met with and learned from Colombian Presbyterians whose lives are at risk because of their work for human rights on behalf of poor, displaced persons in Colombia. 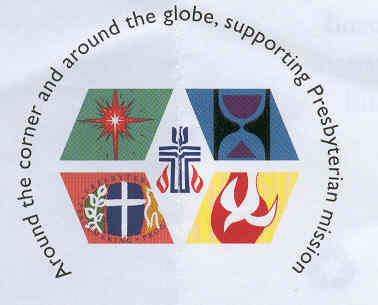 Your gifts to the Peacemaking Offering allowed fifteen International Peacemakers from fifteen countries to spend time in sixty presbyteries, one synod, and one Presbyterian school to make connections with U.S. Presbyterians and discuss issues of justice and peace in the fall of 2005. Gifts to the Christmas Joy Offering support ministries that make real God's love in Jesus Christ throughout the year. Because of your gifts, the Board of Pensions was able to respond to the needs of church workers in hurricane-devastated areas of the Gulf Coast with emergency grants. Hundreds of students are able to attend racial ethnic schools to discover the gifts that God has planted within them, and to nurture those gifts to serve not only their own communities but all of God's people. Since your gifts last year, One Great Hour of Sharing of Sharing responded to a record number of hurricanes and such other disasters as the earthquake in Pakistan. While these disasters require immediate and long-term assistance, even more of your One Great Hour of Sharing gifts have helped our sisters and brothers around the world address chronic needs. Through your outstretched hands, many more families have felt the embrace of God's love in very tangible ways: sufficient food, ready access to clean water and medical care, and a firmer grasp on hope. Because of the Pentecost Offering, almost $1.8 million has been raised since 1998 by congregations like yours for ministries with children at risk. First Presbyterian Church in San Leandro, used its share of the offering to fund a senior high youth mission trip to minister to the very poor in inner-city Los Angeles. The Pentecost Offering makes it possible for your congregation to take an active part in bringing healing and wholeness to children at risk.